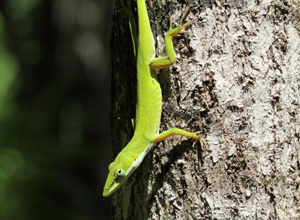 At 85,000 acres, the Fakahatchee Strand Preserve is the largest and least developed of Florida’s State Parks. 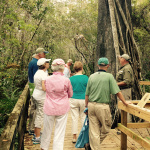 Explore the real Florida and the Big Cypress Bend Boardwalk, Janes Scenic Drive, our numerous hiking trails, or canoe the East River. For a guided experience, get aboard the Ghost Rider, or sign up for a swamp walk. Sign up here! 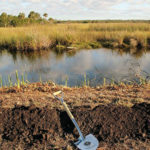 Fakahatchee Strand is one of the most biologically rich places in the greater Everglades — here visitors will experience a portion of Florida’s remaining subtropical wilderness. It is centered on the world’s largest strand swamp, a geological feature unique to the region. Learn about the Strand’s unique ecology and history. You can help preserve this unique wilderness and play an active role in its conservation. When you join the Friends, you support an important mission. Whether you are a trail blazer, administrator, handyman, driver, citizen scientist, volunteer coordinator or potential donor, you have a part to play. You can help. Follow our latest news, be alerted to wildlife sightings, learn about upcoming events and volunteer opportunities, and have access to interesting articles on conservation projects and the Park’s ecology by subscribing to our free electronic-newsletter, the Ghost-writer, and following us online on Facebook. Eric Draper and Patrick Higgins present Jane Parks with the 2018 Mel Finn Award. The new concession program will add to the tours available. The Friends of Fakahatchee want you to share our excitement about the Fakahatchee, join our community, and catch the “FAK-A-HABIT.” If you come to this 85,000 acre wilderness, you will find the lush plant and animal life of the real Florida that you may have thought vanished. Join us. 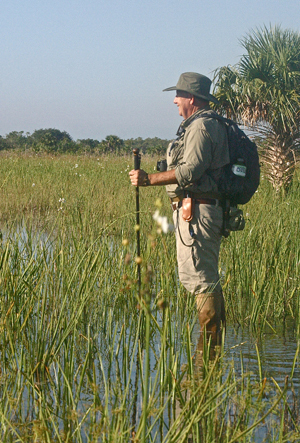 Hydrologically linked to the Everglades system and particularly important to the estuarine ecosystem of the Ten Thousand Islands, the Fakahatchee is crucial habitat to many threatened species including the Florida panther, Florida black bear, American crocodile, wood stork, mangrove fox squirrel and the Everglades mink. It is also home to 47 native orchids (including the elusive Ghost orchid), 38 native ferns, 14 native bromeliads and is recognized as the orchid capital of of the United States, as well as the best example of a subtropical, strand swamp in North America. But it’s more than a swamp. It’s a mosaic of cypress forest, wet prairies, tropical hardwood hammocks, salt marsh, mangroves, sloughs and majestic royal palms. 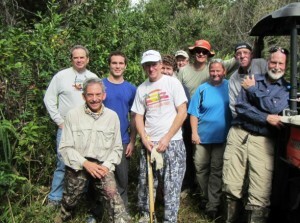 “My husband and I took the Swamp Walk yesterday and had a GREAT time. We are already thinking of returning to this magical place! 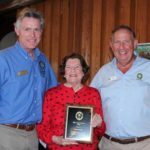 Kudos to the Friends of Fakahatchee. 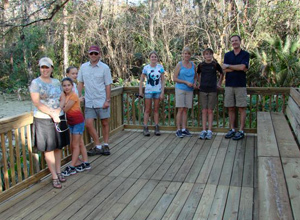 Whether you walk the Big Cypress Bend Boardwalk through one of Florida’s last remaining stands of virgin old-growth cypress, reserve a spot on our tram ride, join us for a swamp walk, become a member or donate, you will be helping to preserve a truly special natural and cultural landscape featuring the largest population of native royal palms in the United States. The beauty of Fakahatchee Strand is best enjoyed by getting off the beaten path with one of our expert naturalist guides. It is a world of water, deep shade and blazing sun. In other words, it is subtropical Florida at its best and most unique. 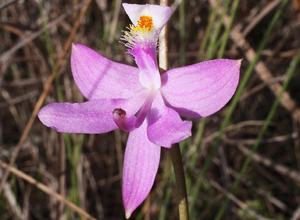 Welcome to Fakahatchee Strand — the Orchid Swamp!